Gardening in a Small Space - Hej Doll | Simple modern living by Jessica Doll. While the spring and warmer weather may have just started making its way into some areas, here in California we start gardening a lot sooner. I started my garden last month and it’s making great progress. This year’s garden is a lot smaller than before since we gave our side yard a makeover. I planted a variety of easy to grow plants that work well in our mild semi-coastal micro-climate. Today I’m sharing my garden’s progress as well as some tips for growing a garden in a smaller space. 1. Figure out how much space you have. If you live in a house and have a yard this will be a lot easier than if you need to make your owns pace. Most summer garden plants require lots of sun to reach their maximum potential, so keep that in mind when planning out your area. This year after our side yard makeover I went from having two 4×8′ garden beds to having two 30″ x 30″ beds. This meant making some choices when it came to plants. 2. Make space if you need to. If this is your first year growing and you need to make space, keep in mind the lighting conditions throughout the day. If you live somewhere with a balcony, try to choose pots and planters that have some area for drainage or a water reservoir. Since my garden area is smaller this year, I’ve opted to put other plants like my blueberry and some herbs the kids wanted to grow into standalone pots that aren’t in the main garden boxes. Think about your climate and what the average temperature in the summer is. 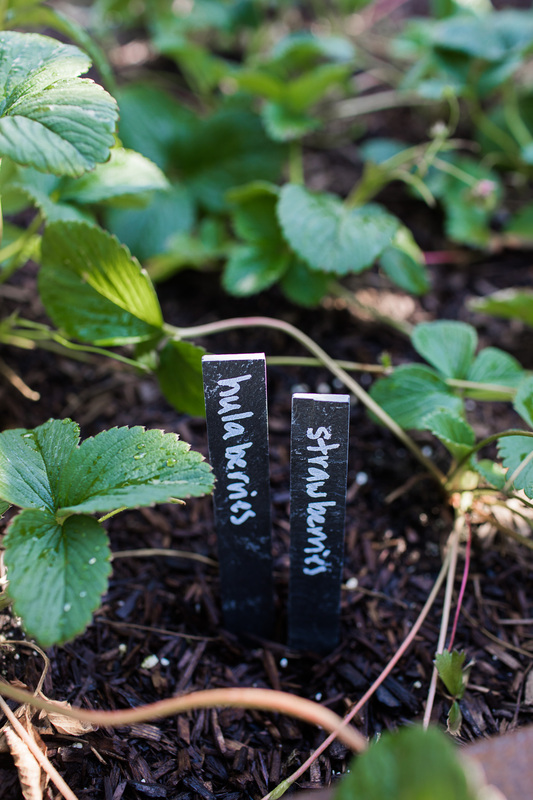 I chose to plant a few of my favorites, like sugar peas, tomatoes, and strawberries, while throwing in some herbs like basil, African basil, purple basil, mint, thyme, and cilantro. I also planted a new favorite, hula berries! I know that my sugar peas are not a full sun crop and do not like the hot weather, so I planted them between my tomatoes and the fence to shade them from the hottest part of the day. Most of my other plants love full sun. 4. Set up a watering solution. Be sure that there is an easy way to make sure that you garden gets water every day. We have an automated landscaping setup so that I can run water lines to my garden, but we haven’t set it up yet. It’s helpful for when we travel and can’t always water the plants. Since I’m also still working on getting the seeds to grow in between my pavers, it’s easy for me to water the garden daily too. If your plants are in pots they should have proper drainage which can be achieved by having a water tray under the pot, or filling the bottom third of the pot with filler so that the water can not pool up and cause rot. 5. Maintain your garden and enjoy! Be sure to pull weeds and keep an eye out for garden pests. My favorite deterrent is organic neem oil because I don’t like to spray chemicals near food I’m going to eat. It’s easiest to check your plants when you water them, or when you go to pick your produce. 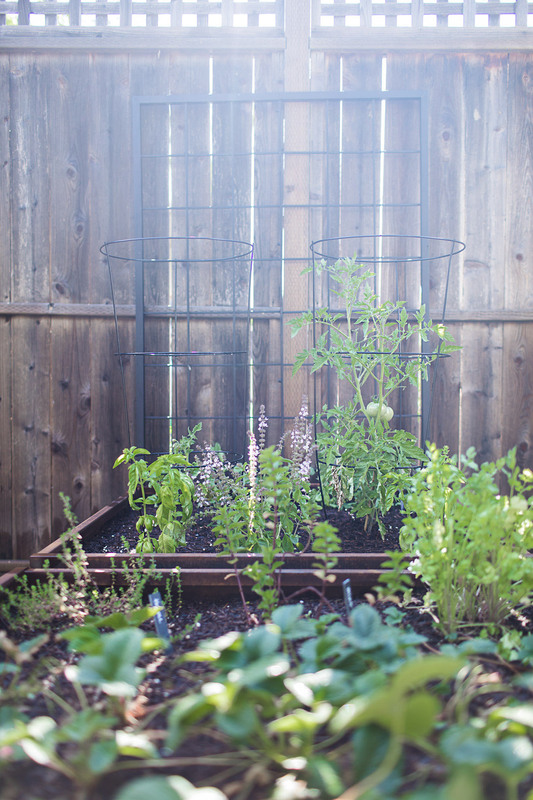 Do you grow a Summer garden? What are some of your favorite plants to grow? If you don’t have one, would you like to? I definitely have the OPPOSITE of a green thumb. Any plants I buy end up dying within a week! I don’t know what I’m doing wrong. I inherited my mother’s brown thumb. I somehow manage to kill every plant that has entered my care (RIP mint, tomatoes, aloe, pepper, cactus, succulents…). This post linked me to your post about house plants, which I may have to attempt. Hopefully having plants in my view will help me remember to water them! I have a huge yard but I still keep my gardens to smaller spaces. I love using containers for my fruits and veggies. I have tried to grow tomatoes in my backyard. But mostly before they grow up they are spoiled by bugs. Some of them are only able to grow big. give some tips to get rid of these bugs. We dont hav a huge backyard but we have made the most of it with a veggie garden. My husband loves to do it! Thanks for these great suggestions. I have a very small yard and struggle with a garden. This looks like it might work for me. Great tips! I like how organize your garden is. We have a big yard but prefer to do gardening in a small space. My son loves to plant veggies and strawberry. Many people think you need to have a huge place or a backyard to plant your edible garden but it is not true. A lot of good edible plants can be grown in small places. Great article! I have a very small patch that we dug out many, many years ago to plant a vegetable garden. It got very overgrown and very shaded from the maple tree we planted, so until last year, I hadn’t used it in a long time. We cleaned it up, added soil and although last year wasn’t a great harvest, I am hoping this year will have a better yield. You make it look so easy and worthwhile to put in the time and energy! Thanks for the encouragement. I am going to plant this weekend. Gardening in a small space can be really fun and beneficial. No matter the space you can still grow heaps of products. We have a large garden but even if I had a small space I would definitely still garden.